The HCR900 is ideal for demanding site preparation applications. It’s simple, durable and efficient. The HCR900 ES and the HCR900 ES20 incorporate a self-adjusting drill system designed to maximize drilling efficiency through to the bottom of the hole. By automatically controlling the impact force, feed force, rotation force and dual dampener pressure, the HCR900 continuously adapts to the changing rock conditions. As a result, drilling performance and the life of the drill tools are increased, while lowering fuel consumption. Maximize operator performance with the ultimate in drilling technology. Ergonomically designed to minimize operator fatigue. Stable chassis combining a low center of gravity, high ground clearance and protected undercarriage enhances stability and confidence when tramming and drilling on rough terrain. Single-lever drilling controls allow easy operation of the drifter. Sliding suction cap can be raised to allow a fast visual check of operation. Walk-around, ground-level maintenance provides fast, easy upkeep or repair. Hinged service doors provide easy access to required areas. Engine, compressor and hydraulic oil temperature gauges are highly visible, allowing the operator to monitor machine functions while remaining focused on the drilling. Extension boom increases drilling pattern flexibility. Design versatility allows for drilling either horizontally or vertically. Upgraded dust collector has higher suction capacity than previous models. Dust collector includes an effective pre-cleaner to reduce escape of drilling dust. An optional dust suppression system is available for difficult drilling conditions. Low-emission, Tier III Caterpillar engine offers low fuel consumption and meets major exhaust emissions regulations in Europe and the United States. Heavy-duty Furukawa undercarriage featuring a pentagonal section design to reduce dirt build-up and track wear ensures strength and durability. 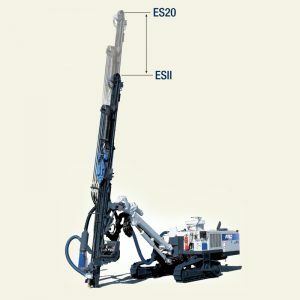 HCR900 ES20 is ideal when drilling requirements exceed 12′. Depths up to 18′ can be drilled without changing rods. Angle indicator for quick and easy drilling alignment. Low-emission, low fuel consumption Tier III Caterpillar® engine meets major exhaust emissions regulations in US and Europe. Type 2-variable displacement piston pumps supply pressure oil for both travel and drilling. 3-gear pumps for cooling and dust collector.